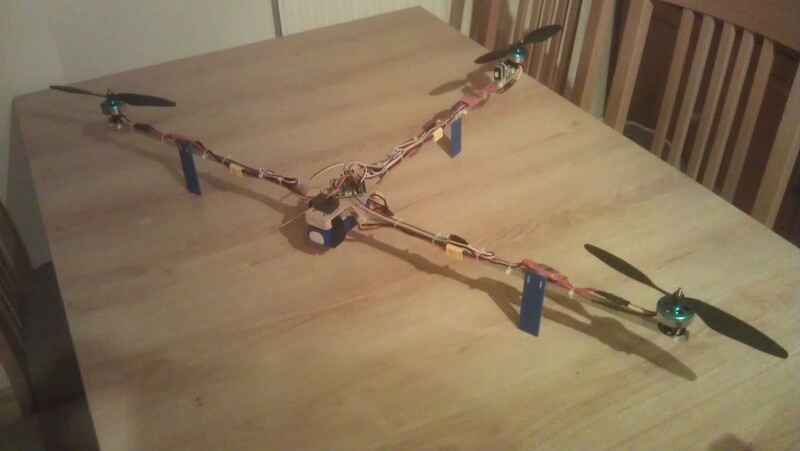 ..:: Optimized RCExplorer Tricopter Template ::..
Five days later, ananas1301 said he tried out the modified design and it worked out nicely, it could even be used as a T-copter instead of the normal Y-configuration. That inspired me to make this modified design more user-friendly, so that more people could enjoy the benefits of the new design. NOTICE: The original design belongs to RCExplorer.se . As the new template is completely based on his design, i cannot claim ownership of it. The new design still belongs to RCExplorer.se . I will only shamelessly claim credit for the improvements made to the design, while staring in amazement at the guy who brought multicopters to the masses. Click on any image to download. - Added modifications so you can use 9 mm, 10 mm, or 12 mm booms. - Added the optimized RCExplorer.se "coffin" design. Only available for 10 mm booms. - Added the Battery and Camera plate. - DWG and DXF files available for download. These are for use in CNC/Laser Machines. Here you can see how the arms pivot on the outer screw. - AutoCAD 2012 render. Hey colorex! I just got an awesome idea! 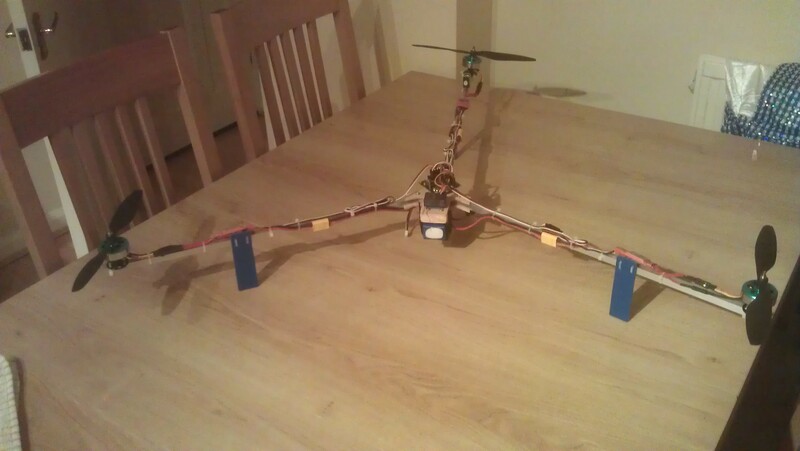 How about designing a special piece of wood that would allows you to use the Tricopter as a T-Copter. That woodpiece would be inserted into the frame so that the two arms wouldn´t be able to move any more. Is that innavitve?! I think that would be a cool option for all those guys out there which only want to cut out one frame because they are too lazy to build a new one. Also at the moment it is very windy, cloudy and rainy in Germany. I´ll get some flying results as soon as I get flying agian. This is what I mean. The left one shows how my cables are going. The right one shows how they could go as well. 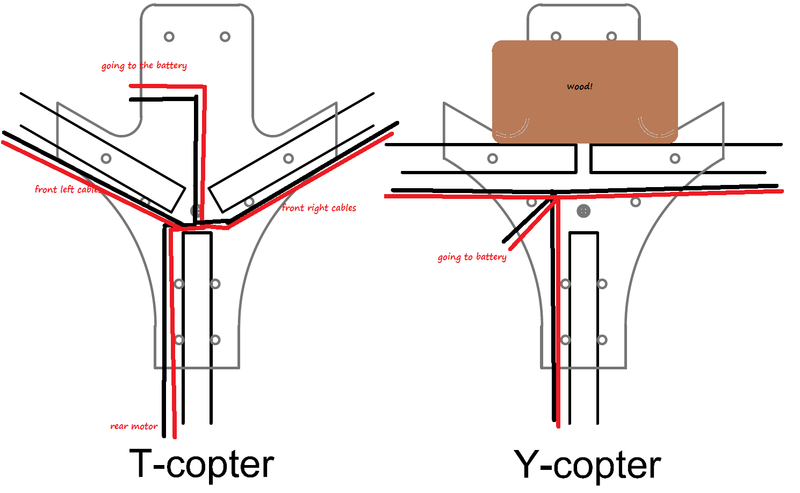 If you place your battery so that the cables are looking back you could make the right one work with both the T-Copter and the Y-Copter. EDIT again! I just realised a fatal error on my right picture: The 4 wires coming fron the front two motors all shoud go under the screw not above. Otherwise you couldn´t fold out the arms to touch the screw, they´d touch the wires which we don´t want. There is another solution for that problem, you drill holes into which you can just push in screws to keep it where you want. Otherwise it's just better to tighten the frame enough so the arms just sit there, that way they can give way a bit in a crash. Yes! please post pics, and tell me if we can make the frame or the instructions better in any way! The user-submitted pictures posted below will be reposted in the pictures section. I prefer the coffin design with a few lightening holes drilled in it. The KK board is protected better with it. I just cut a hollow foam block to protect it from the top. Anyone sell these precut and drilled out of G10 for a reasonable fee? Not that I know of, but if you find someone that will, I'll give you the CAD for it. Just ask. I have been playing over the weekend and this is what I have come up with. so much better than the version i had previously. lets just hope i can get it in the air :S and keep it there. the plans are good i think some way of protecting the kk board would be good though. 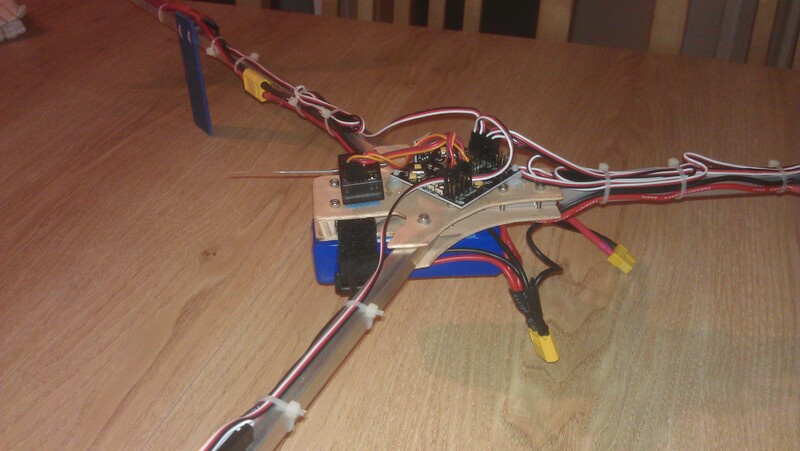 @voipmonkey It seems like it is not a very good idea to put those ESCs out there. Here is a link to the problem.